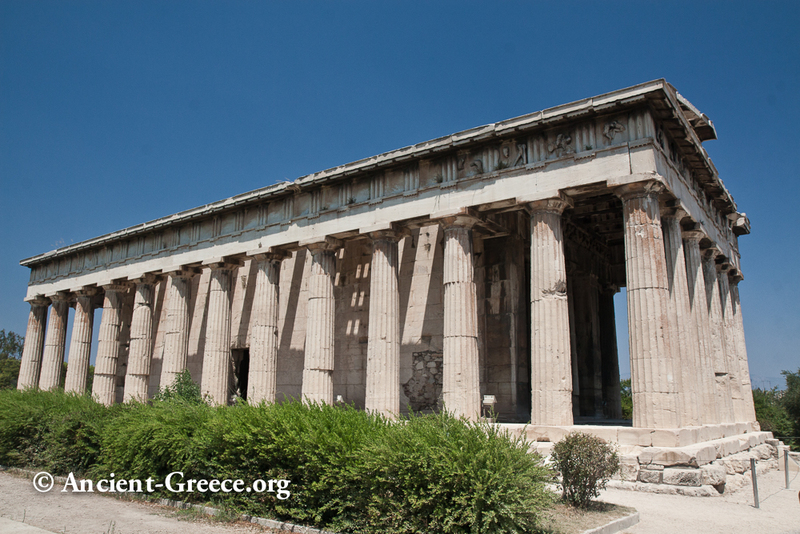 The Agora (Αγορά) of Athens today is an archaeological site located beneath the northwest slope of the Acropolis. 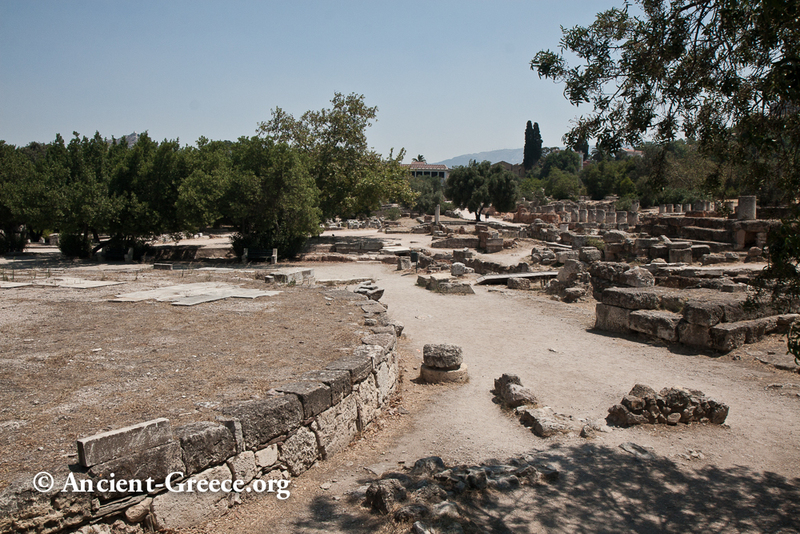 The word "agora" applies to an assembly of people and by extend marks the gathering place. In modern Greek the term means "marketplace". 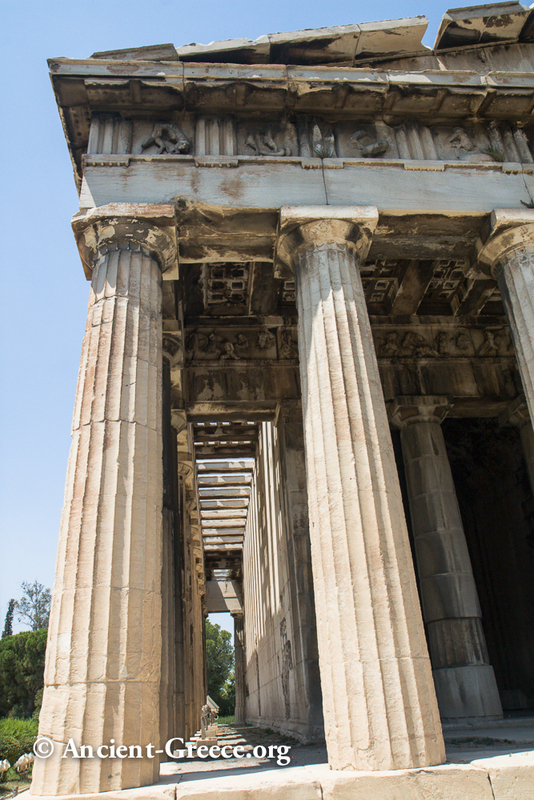 Just about every ancient and modern city includes a place for an agora, and the Agora of Athens, being located at the heart of the city, remained in use either as an assembly, as a commercial, or as a residential area for about 5000 years. Consequently the area has undergone countless building, destruction, and rebuilding cycles. 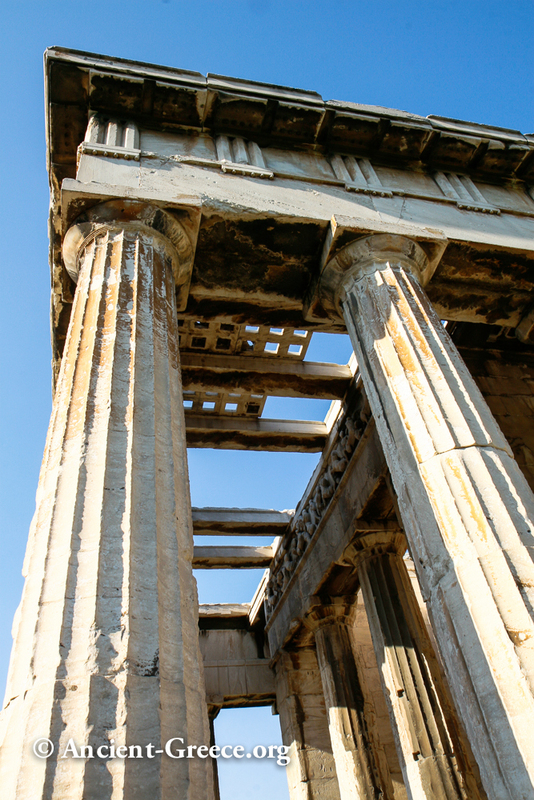 Today this strata of history has been distilled through excavations to expose the Agora's important functions from Archaic to Greco-Roman and Byzantine times. With minimal restoration for the most part, a visitor would have an impossible task to comprehend the place it its glory days without some historical background. 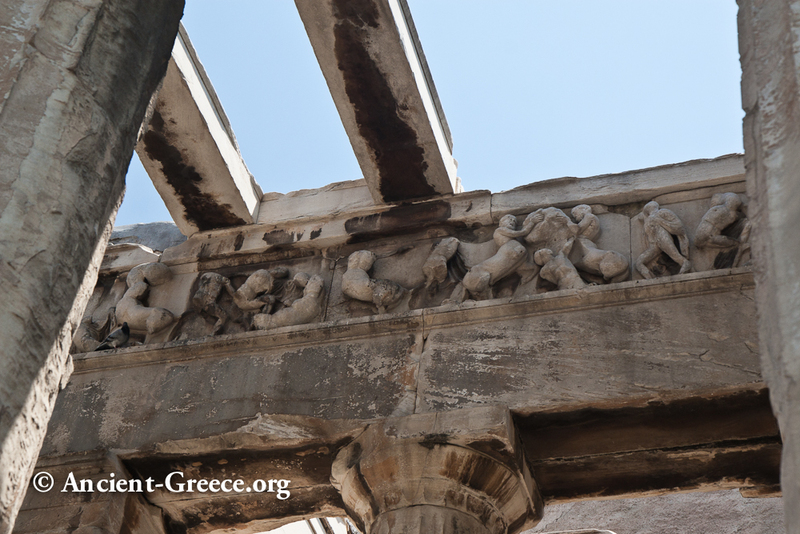 For the most part, for the visitor today, the Agora is not important for the splendor of its buildings, but for the significance of its history. Contrasting with the austere ruins in the middle of the archaeological site however, two splendid buildings stand as testaments to its past glory: the humble Temple of Hephaestus, which is the best preserved ancient Greek temples from the Classical era, and the impressive Stoa of Attalos--a building of the Hellenistic period that was rebuilt from the ground up based on its ancient appearance. 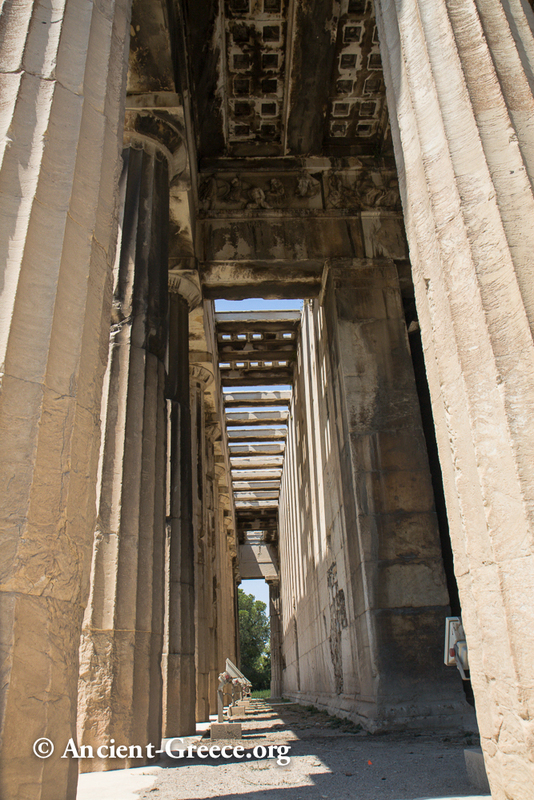 Panoramic view of the Agora of Athens. 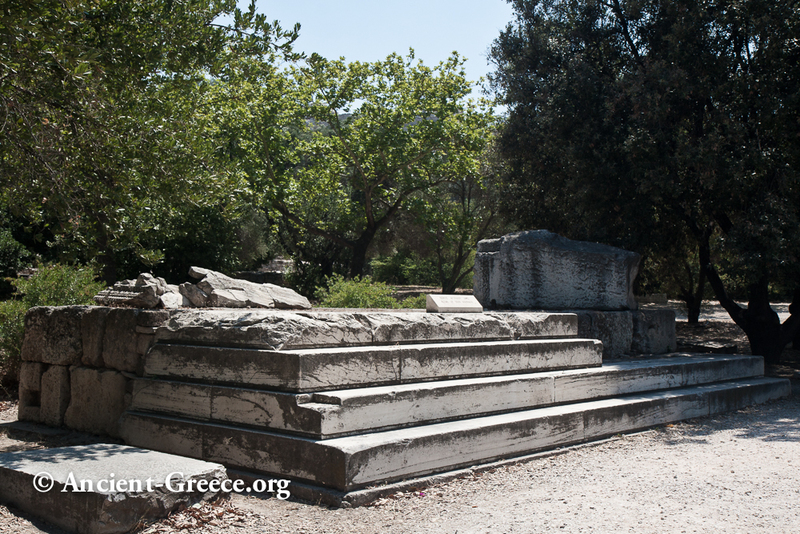 The Hephaisteion (c. 450 BCE) is on the left, the Stoa of Attalos (original built circa 150 BCE. Rebuilt in 1953-6 CE). 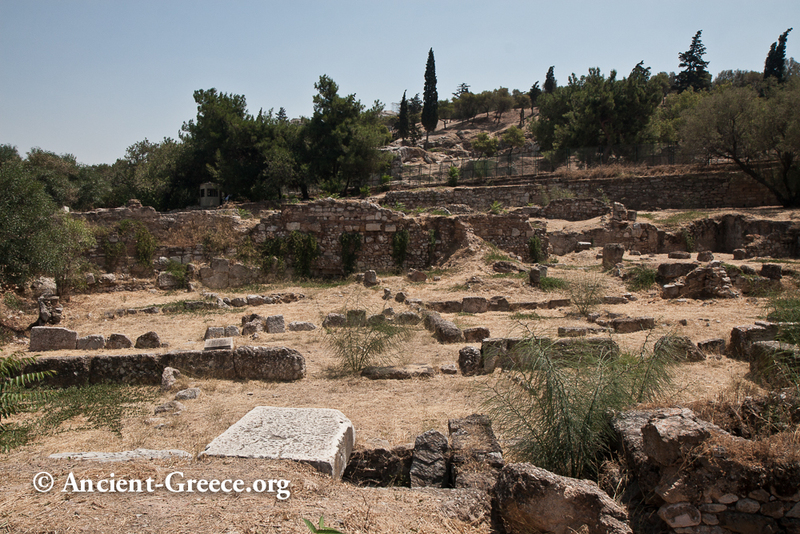 The Byzantine Church of Agioi Apostoloi in the front-right. 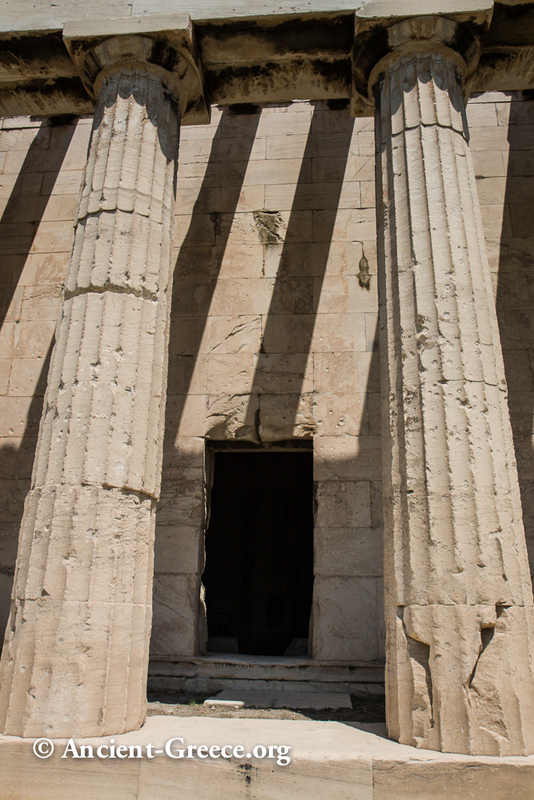 Details from the Doric Peristyle of the Hephaisteion. The ceiling and the frieze are visible. 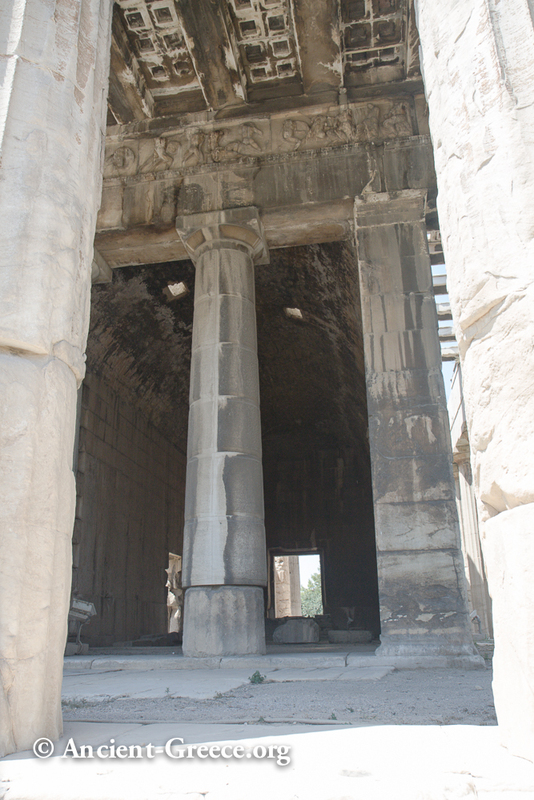 Three views of the East Facade of the Hephaisteion, with view of the interior. The arched ceiling was created when it was converted into the Christian church of Agios Georgios. 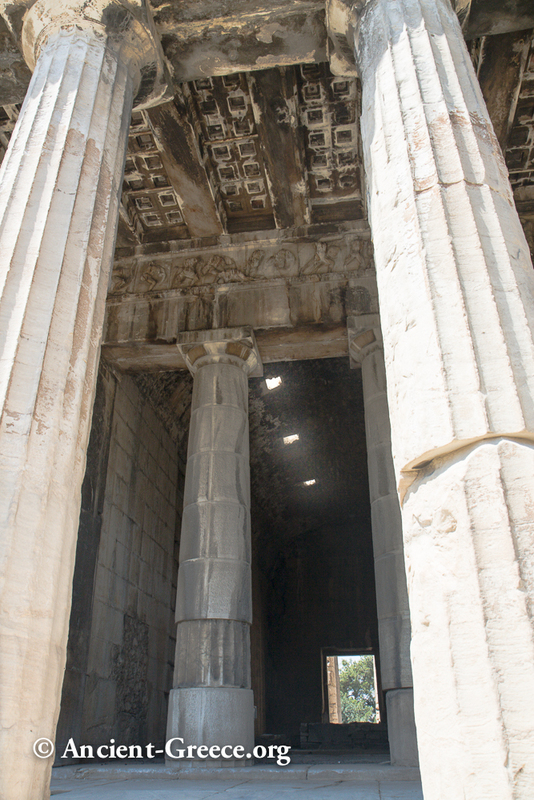 The Temple of Hephaestus (Hephaisteion) Peristyle with the well preserved ceiling blackened by years of air pollution. 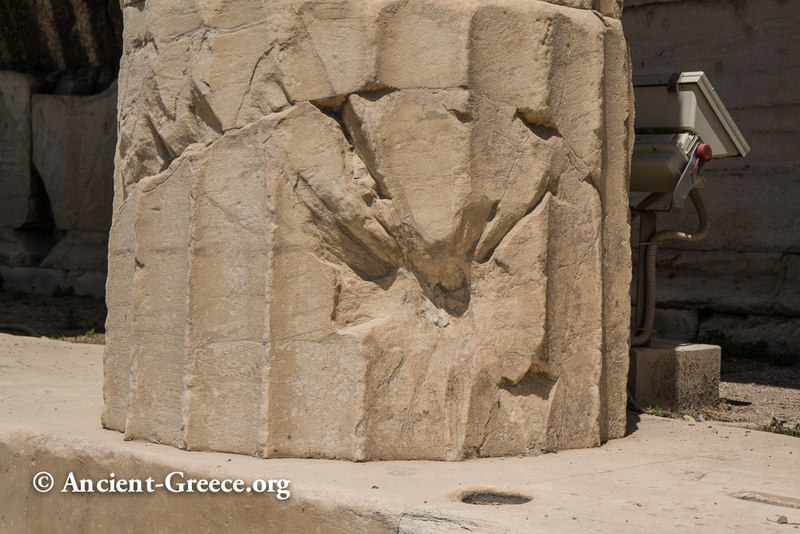 The walls and columns of the Hephaisteion are riddled with what look like bullet strikes. One can imagine a poor soul holed in the temple while sprayed with gun fire. We could find no further information regarding these marks on the site or in the literature. Several views of the cross beans that supported the buildings. The continuous frieze is also visible. 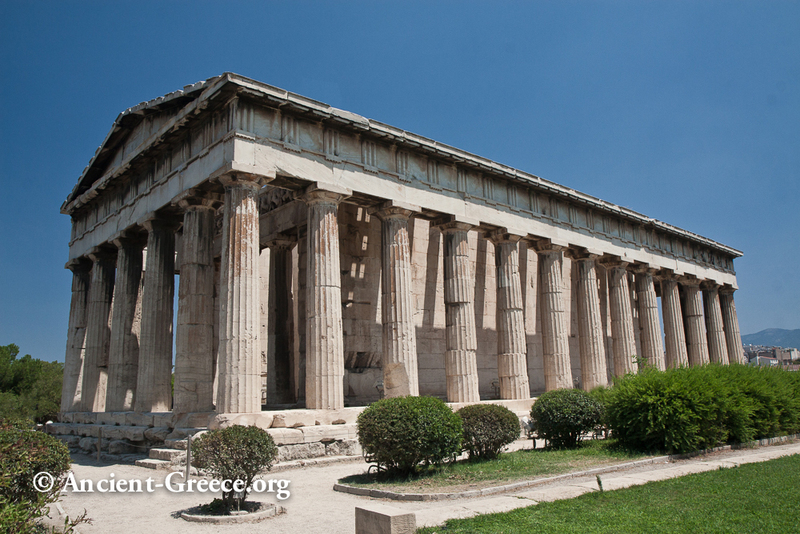 In Classical Greece it functioned as the headquarters of the 50 Prytaneis (Executives) of the Boule (the Council of the Citizens). One Prytanes was chosen by sortition from the ten tribes of Athens, and served for one tenth of the year. Prytaneis conducted the daily business of the state, and they formally called the meetings of the Boule and the Ecclesia of Athens, as well as supplementary meetings when necessary. They also received foreign ambassadors. Each day, one member of the Prytaneis was selected by lot to serve as Epistates (foreman or Chief Executive of the state) and to chair the meetings of the Boule and Ecclesia. 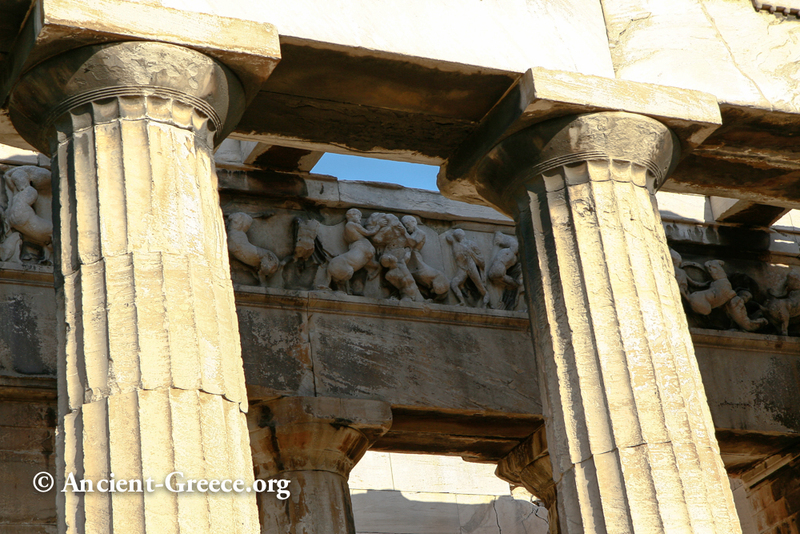 Athenians could only serve as Epistates only once in their lifetime. 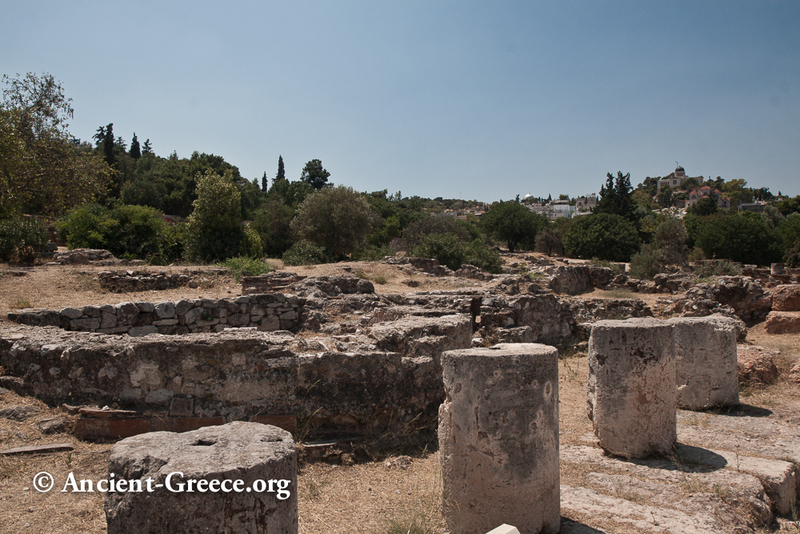 The Tholos served as dining place where the Prytaneis were fed at public expense. A group of no less than seventeen Prytaneis would reside in the Tholos overnight to deal with any potential emergencies. 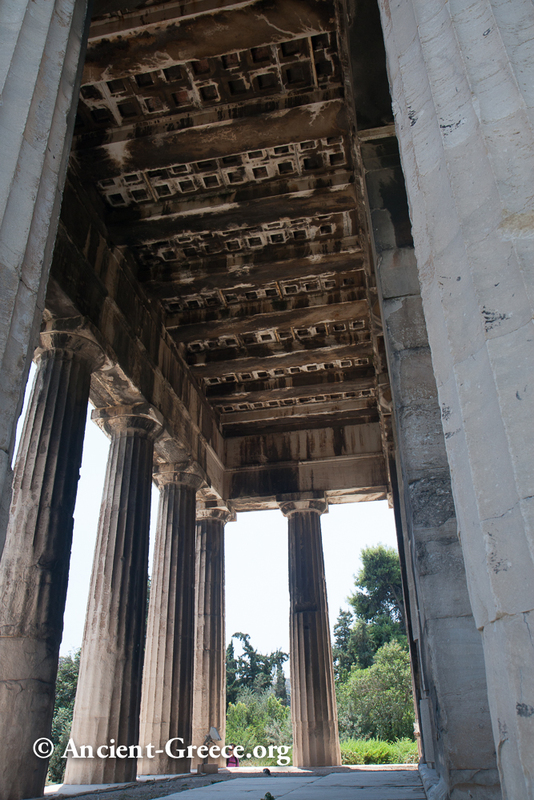 As such, the Tholos represents the pivot point around which Athenian Democracy revolved. 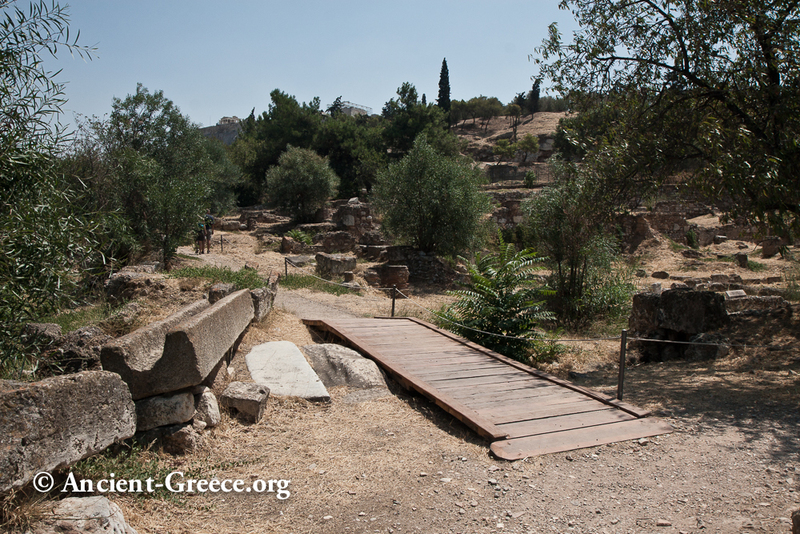 The Propylon (gateway) to the Bouleuterion. 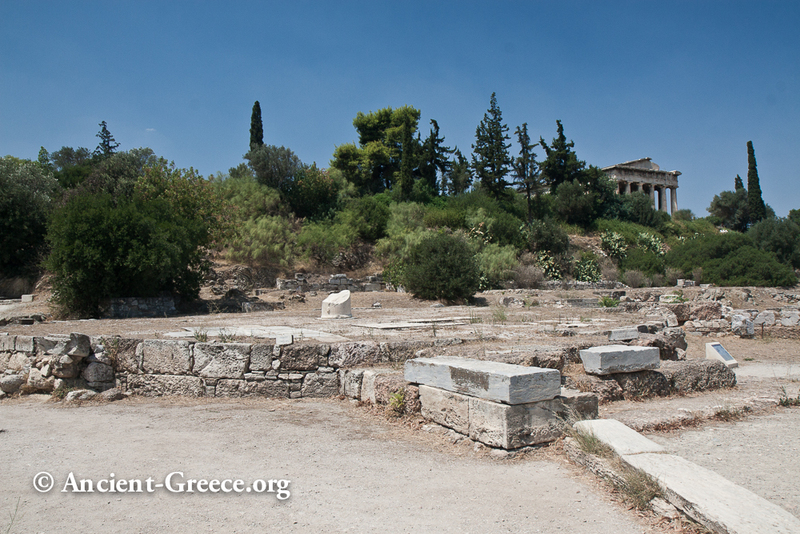 In Classical Athens the Bouleuterion was the actual meeting place of the boule (the Senate) of Athens. The scant remains of this building are from the late 5th century BCE. 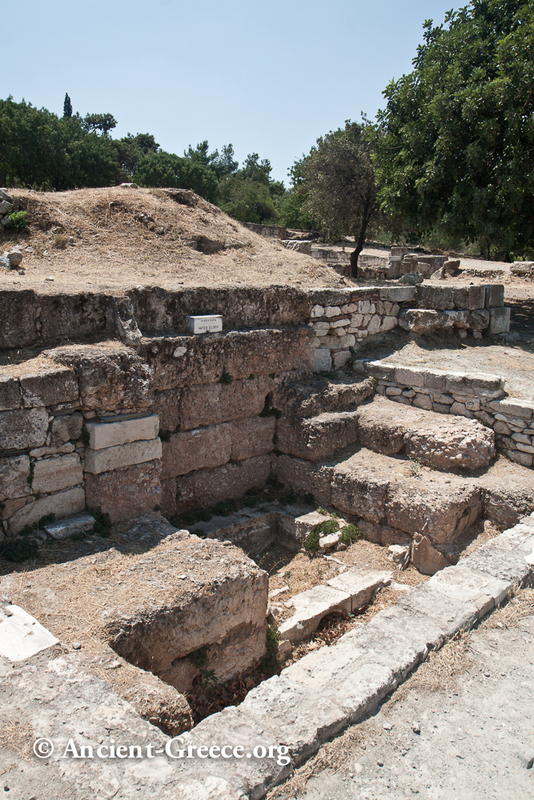 An older Bouleuterion was found under the Metroon. 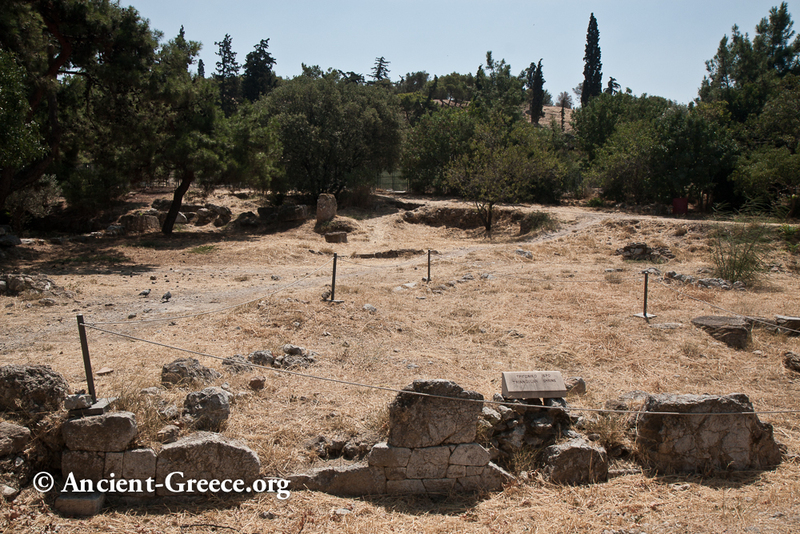 The boule consisted of 500 Athenians who were chosen by lot. 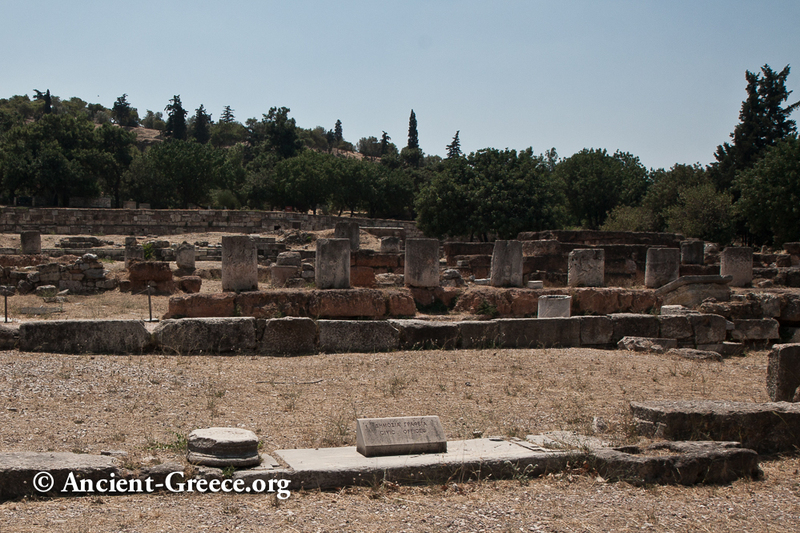 They served for a year and met in the Bouleuterion to prepare the agenda and legislation for the ecclesia--the assembly of citizens responsible for legislation, military affairs, and for electing the strategoi (military Generals) and magistrates. The boule supervised the state budget, and had wide responsibilities in all aspects of the state government. It also supervised public officials. The surviving torso of a statue of the Roman Emperor Hadrian (117-138 CE). 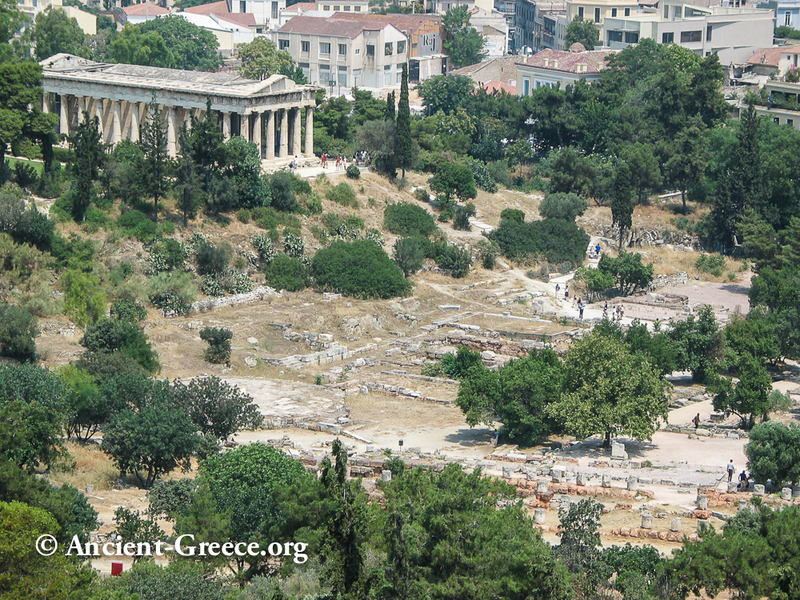 Ruins of the Metroon (2nd century BCE) in the foreground with the Hephaisteion in distance. The Metroon was the state archive where official records were kept. 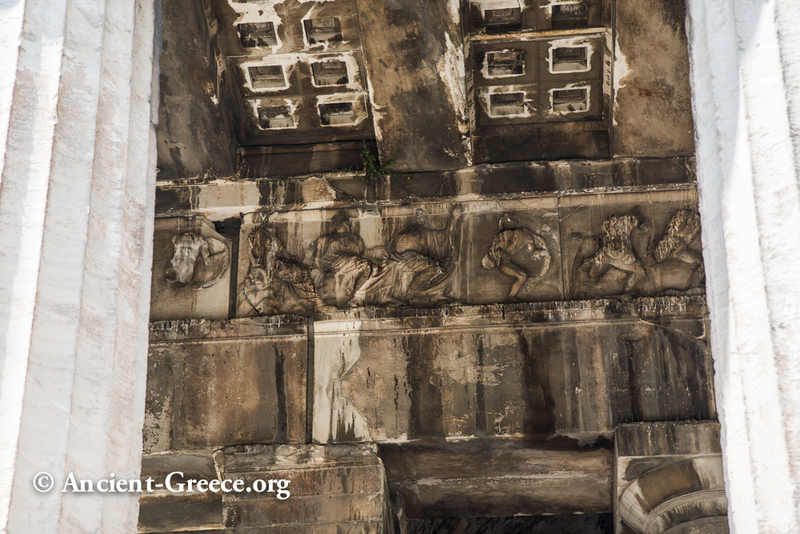 It also functioned as a sanctuary of the Mother of the gods. 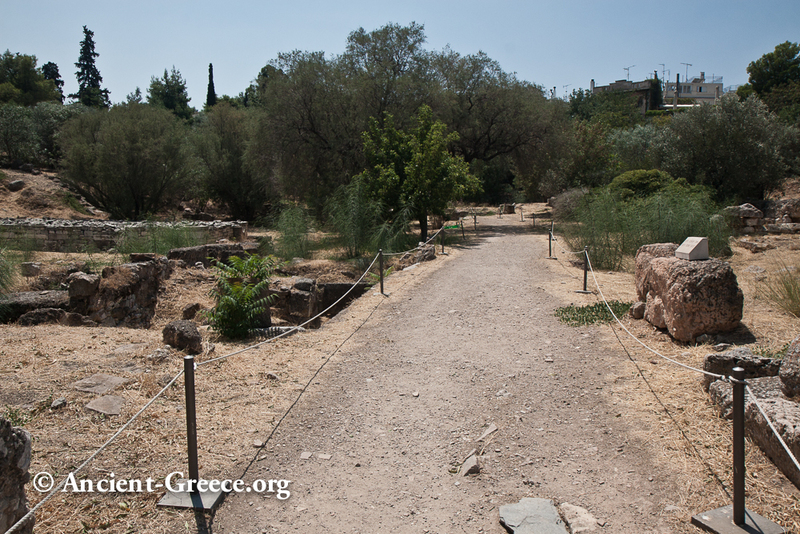 The remaining fence that surrounded the Monument of the Eponymous Heroes (circa 330 BCE). 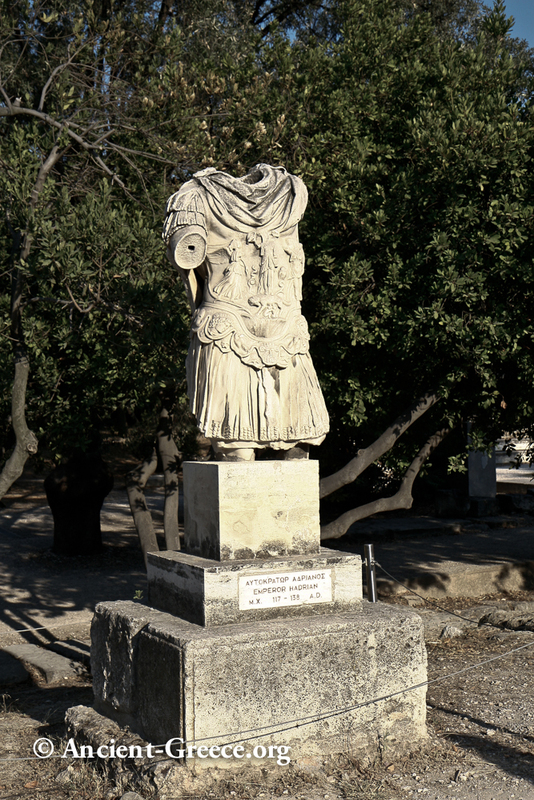 In Classical times it included ten bronze statues--one for each of the ten Athenian tribes. The Monument of the Eponymous Heroes also served as a public announcement board of sorts. This is where state officials posted state sponsored events, i.e. draft legislation, military events and conscription, etc. 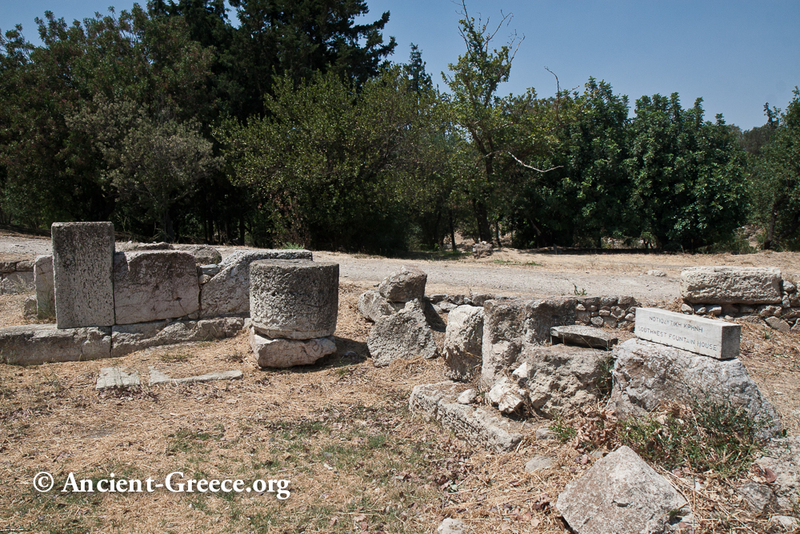 The Altar of Zeus Agoraios (4th c. BCE). It was originally located in the Plyx moved to its current location in Roman times. The ruins of the civic offices. The Klepsydra (water clock) was used to time speeches. 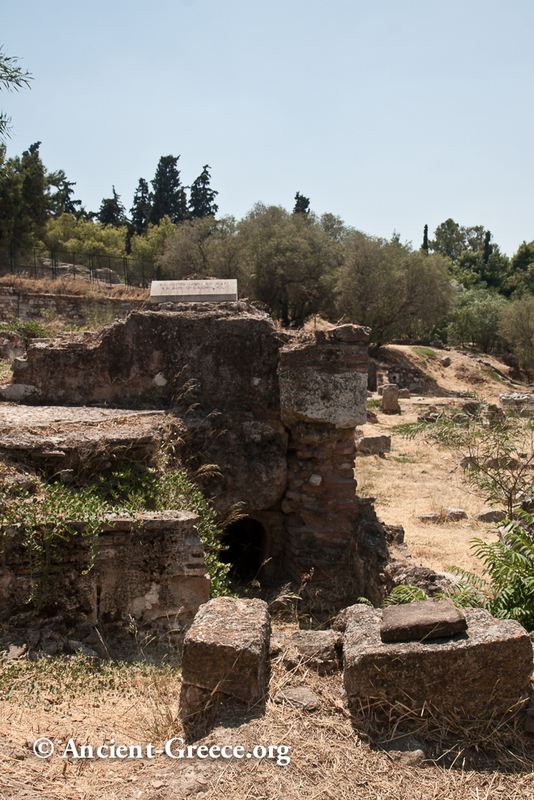 View of the aqueduct dated to the 4th c. BCE (left) and the Southeast Fountain House (right). 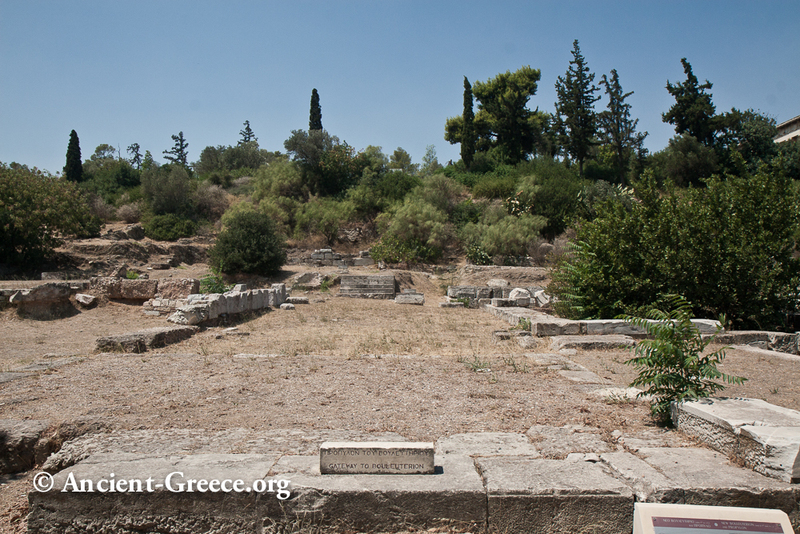 The very faint remains of the Triangular Shrine, which was one of the numerous small shrines dedicated to worship in the Agora. 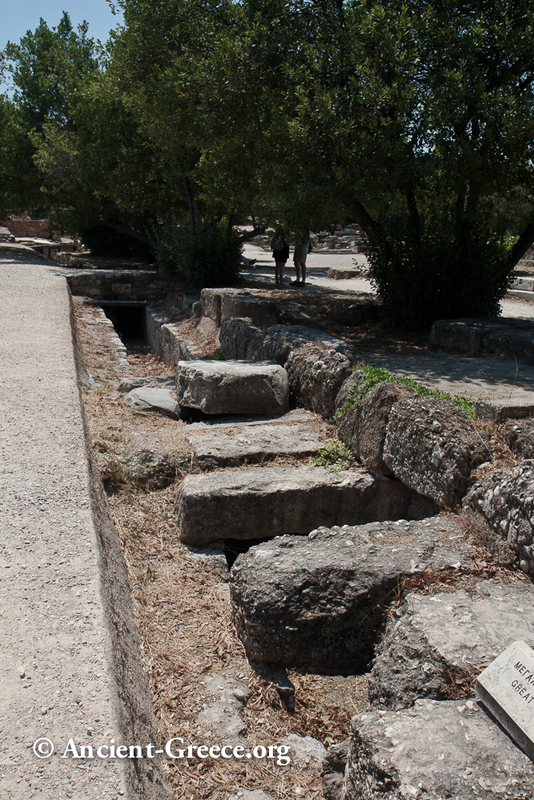 Two noteworthy ancient streets: The Road to Pireas (left) and the street of the marble workers (right). The ruins of the state prison are outside the main Agora, southwest of the fountain house. 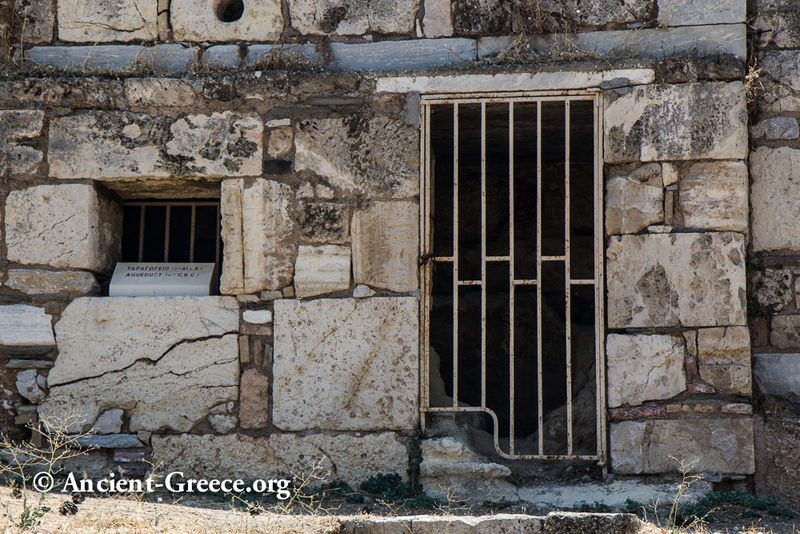 Many have been tempted to speculate that this is the death row where Socrates was held, but no evidence exists to identify this particular building with the end of the philosopher's life. 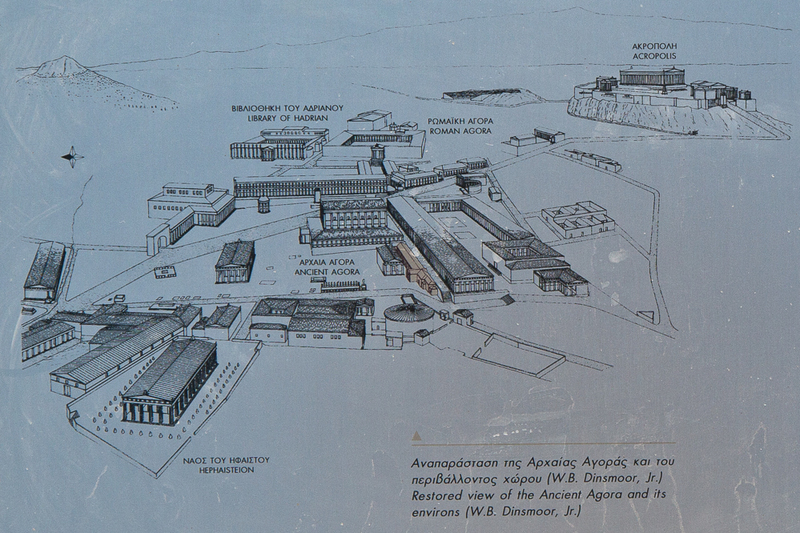 The Dekasterion (court house was near the Klepsydra and the state prison. 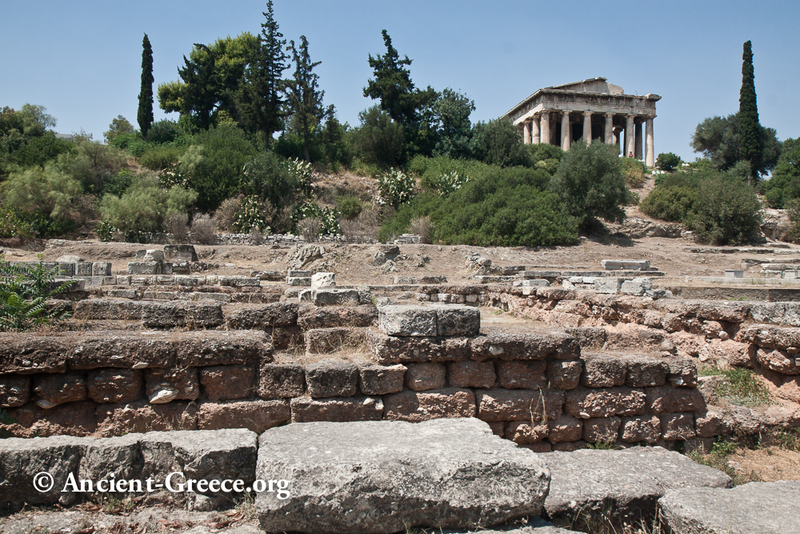 Photo of the Tholos, the Bouleuterion, in the foreground, and the Hephaisteion in the background. 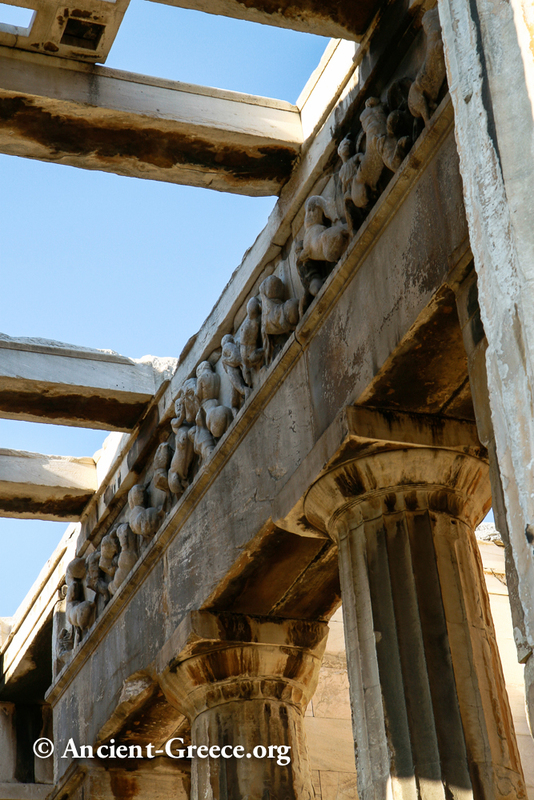 The Middle Stoa (180-140 BCE). 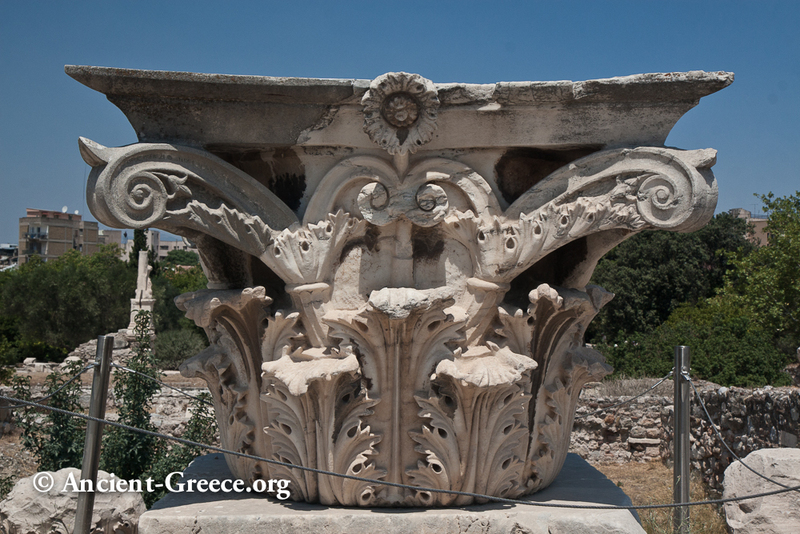 A splendid example of a capital of the Corinthian order. Anyone who has ever carved a stone can appreciate the hundreds of hours of skilled labor that went into creating such piece of work. 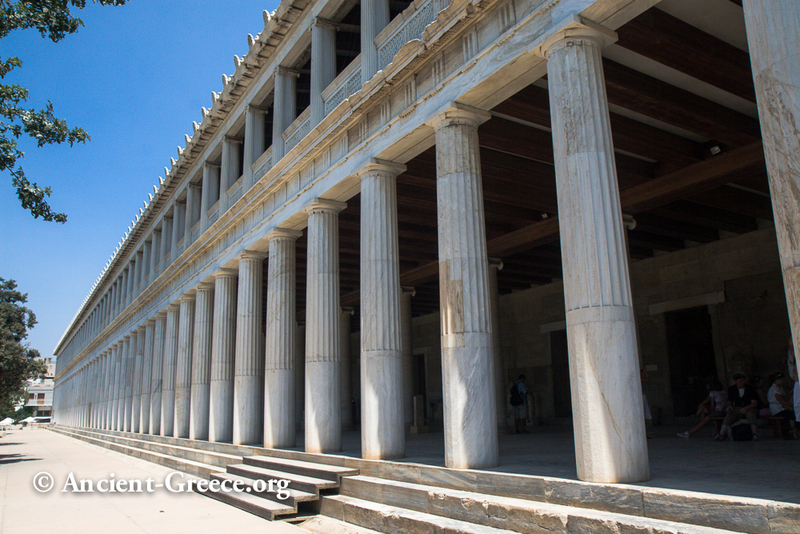 The Stoa of Atallos is the most striking building in the Agora. It was completely destroyed by the Heruli in 267 CE, but it was rebuilt in the 20th century (1953-6). 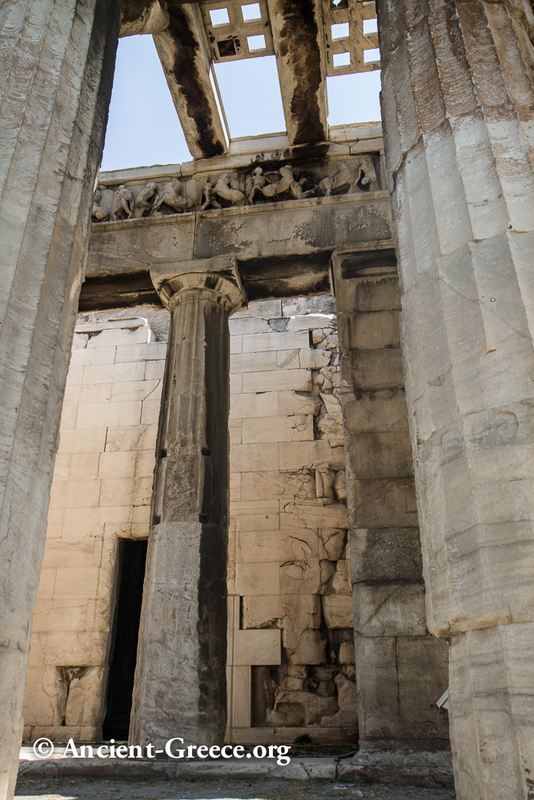 The original Stoa was funded by the King of Pergamon, Attalos II in 159-138 BCE. 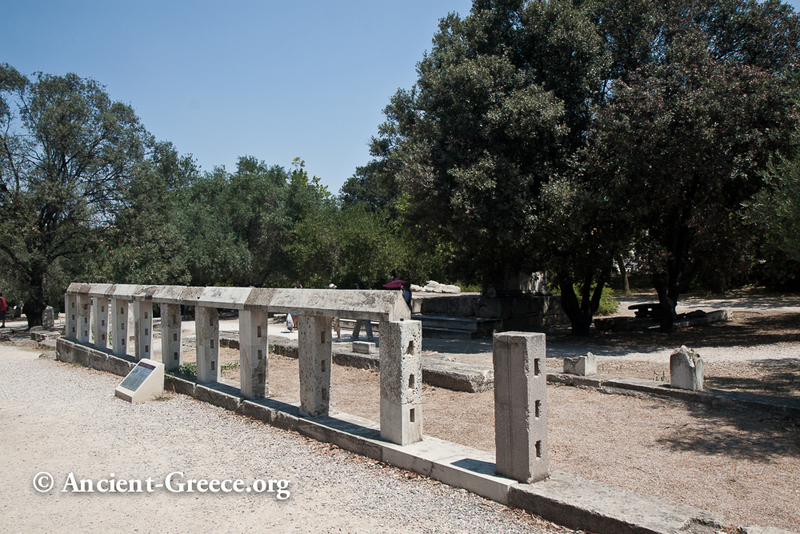 This reconstruction of the Agora appears throughout the archaeological site next to important ruins. 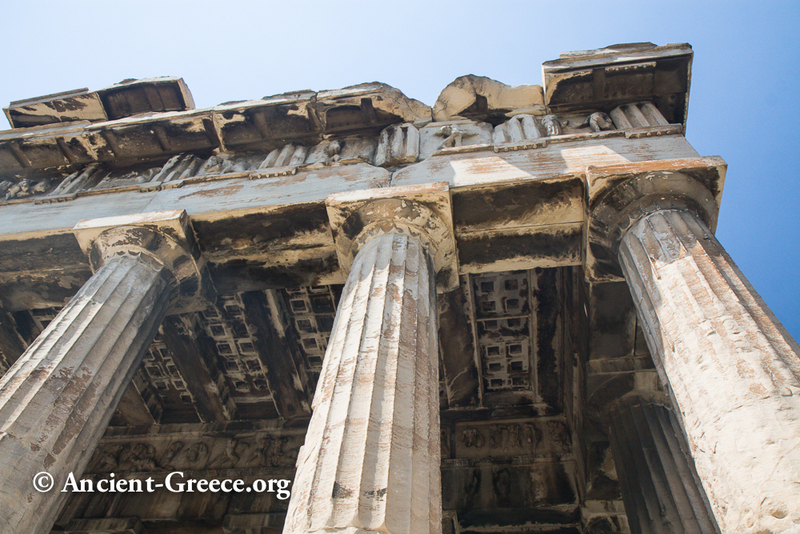 Explanations in Greek and English for each ruin accompany each. 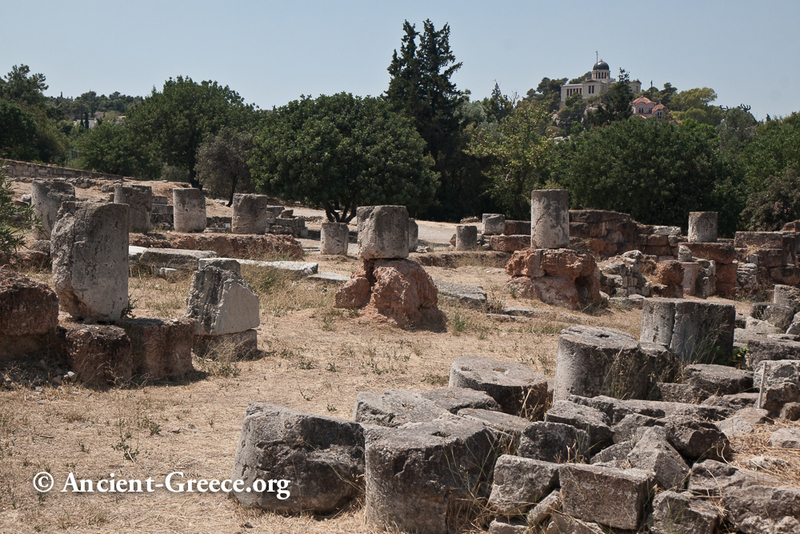 5th-4th c. BCE Rebuilding of the Agora with important public and administrative gildings: Poikile Stoa, Tholos, New Bouleuterion, Stoa of Zeus Eleutherios, Southern Stoa, Mint, Law Court (Dikastiria), several fountains, and workshops.